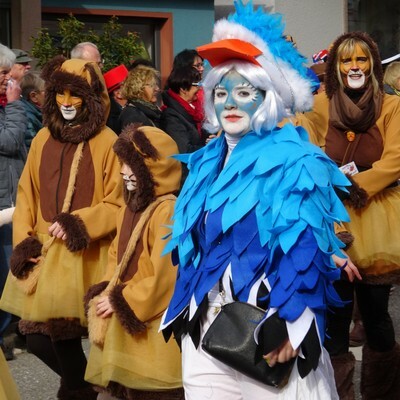 Back in Zell once more... They are and remain my all-time favourites. 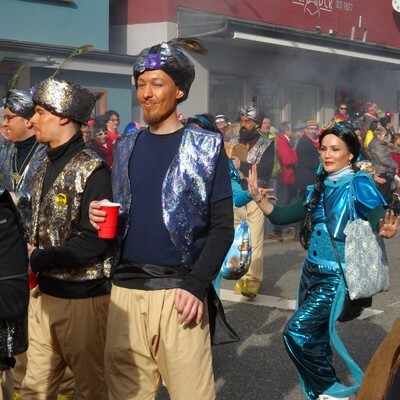 The 2019 Motto was "Disney & Co." and once more the people of the town's eight neighbourhoods proved their imagination. 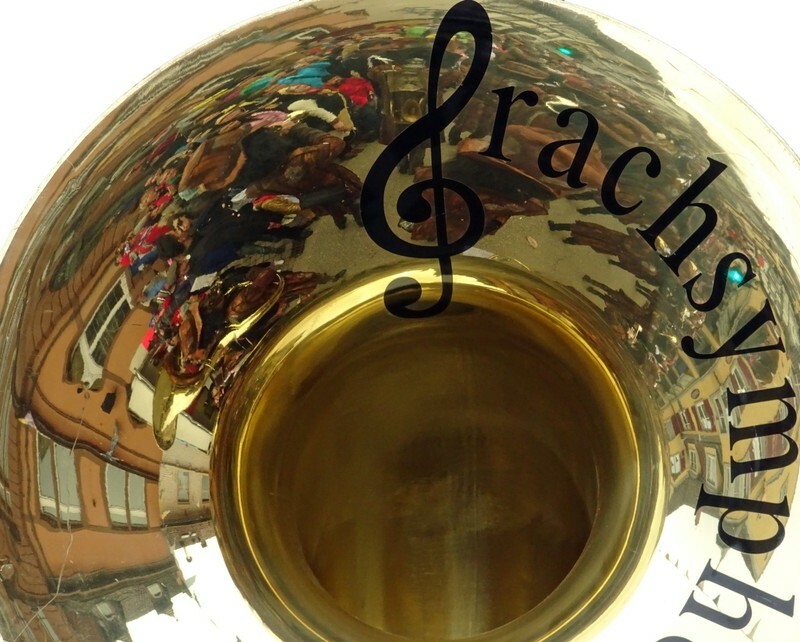 Zeller Fasend reflected in a sousaphone shell... Grachsymphoniker are a Guggemusik band from Basel. 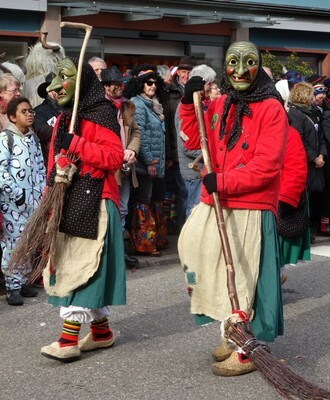 They are friends with the jester guild of Zell and appear in the Sunday parade every year. 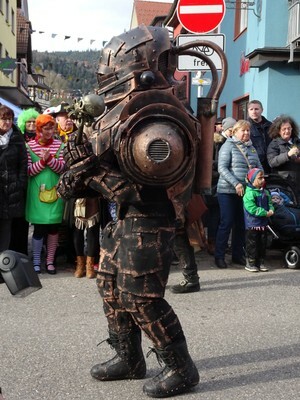 This year the Tambourmajor (conductor) resembled a deep-sea diver while the others were a mix of something extraterrestrial with weird machinery and a circus uniform. 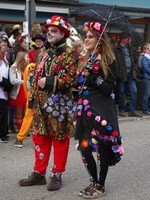 The jester guild filled the street with a sea of colours. 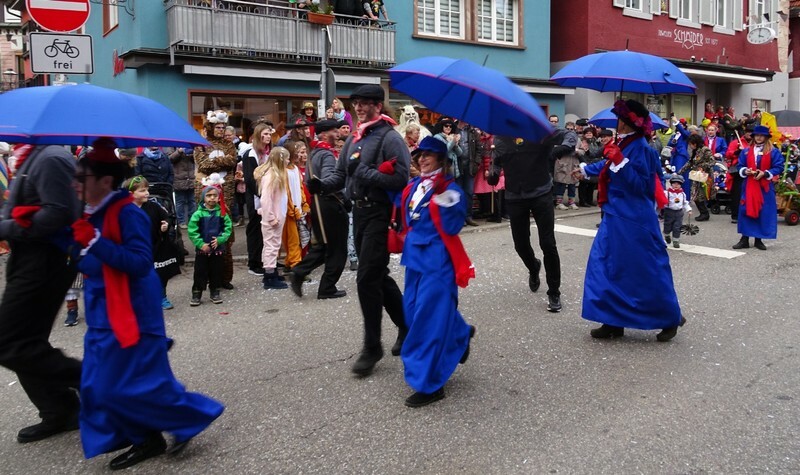 Bändelenarros dance to the sound of the jester march and swing their Saublodere over their heads. 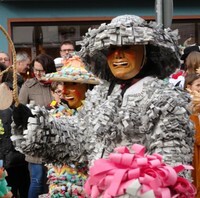 They even made a Newspaper Narro this year. This is how it all started, before they switched to that coloured paper they had used newspapers to create a Häs from material that was cheap and easily available. An interesting way of recycling, or shall I say upcycling? But let's start with the Disney. 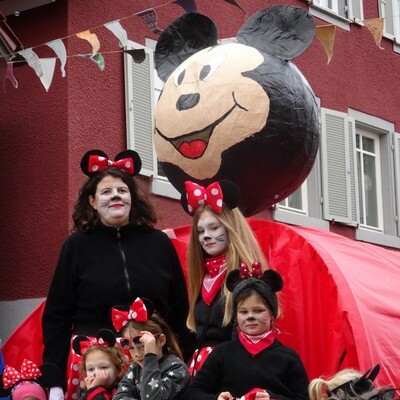 One group with mostly children came as MICKEY MOUSE and DONALD DUCK. 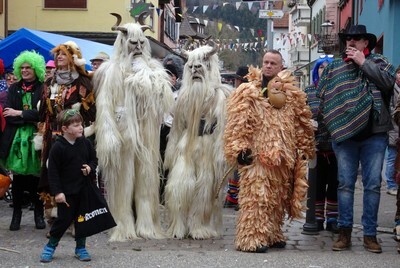 Our moderators were overjoyed to spot their relatives in the parade. 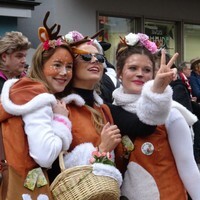 BAMBI - impersonated by the inhabitants of the quarter nicknamed "Little Paris" (no idea why). Bad hunters were on the prowl. But I assure you that no deer, bunny or skunk was harmed. The hunters were too busy with the beer barrel. MARY POPPINS and her Chimney Sweep were dancing in the street. 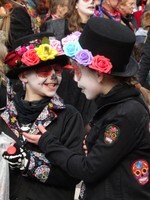 The movie COCO inspired these guys to impersonate the Mexican tradition of Dia de los Muertos, the holiday of the dead. My award for the best makeup goes to them! PETER PAN and Captain Hook were fighting on the top deck of the pirate ship, accompanied by a crowd of Tinkerbell fairies and more Peters. 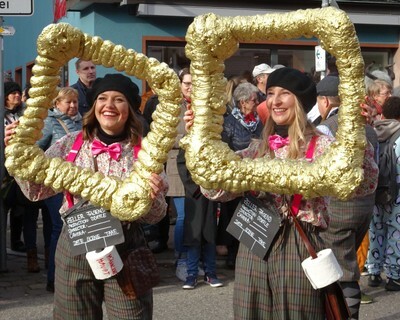 This group chose to appear as an old-fashioned FILM CREW, complete with sound and camera, and plenty of puns and jokes in the details. 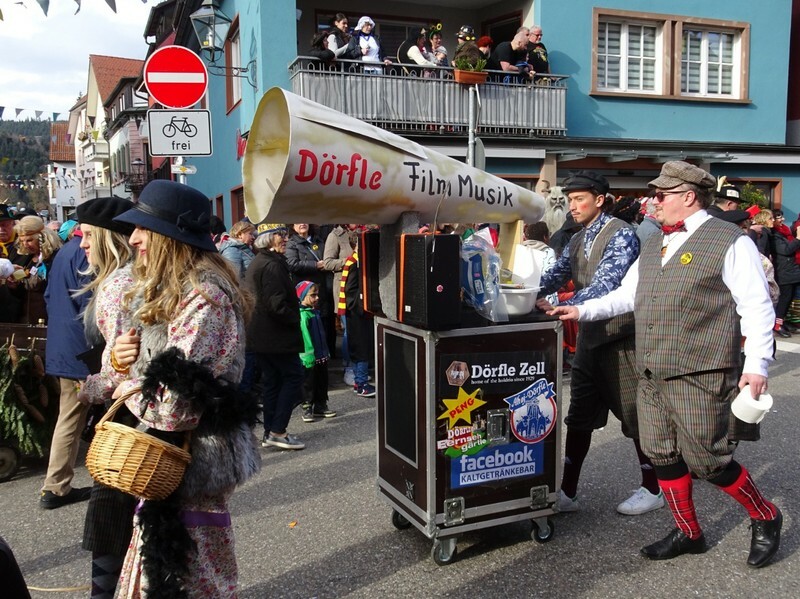 The German word "Rolle", for example, could mean a "role" in a movie or play, but can also be translated as "roll", and that's why the actresses carry the roll of toilet paper. 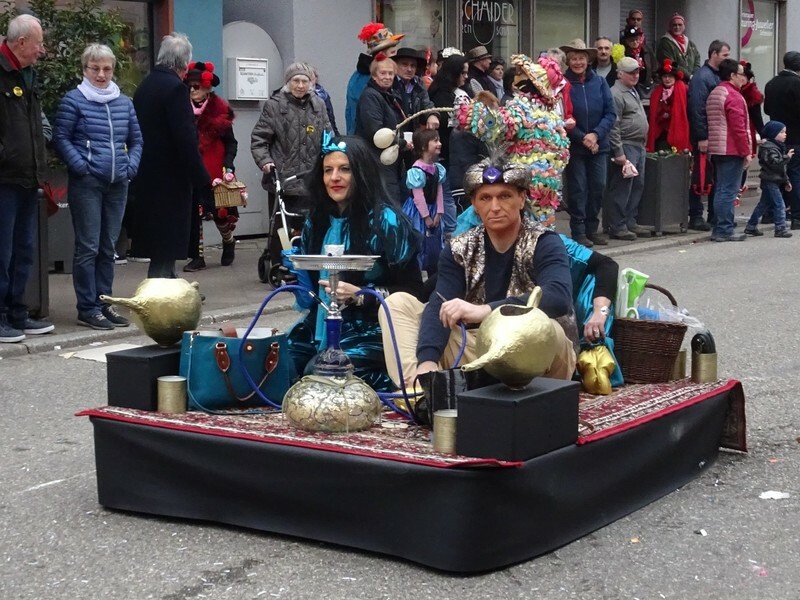 ALADDIN came on a magic carpet (rather low-flying, though...) and with a giant Magic Lamp. Very different spectators attended the parade. 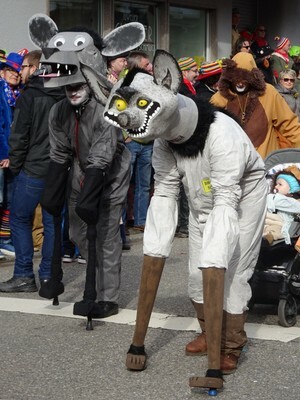 Eckwaldhexen were taking part as usual.